Design & Designer 043 – Kinsey, official blurb: Born in 1971 in Pittsburgh, Dave Kinsey uses his everyday environment as a framework that he then revisits in his paintings. In 1996 he founded BLK/MRKT, creating graphics that combine his urban aesthetic with the sophistication of conventional communication. 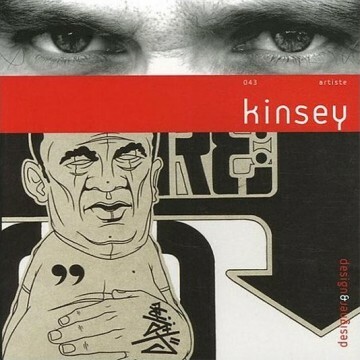 Kinsey today is an artist who is emblematic of the international urban contemporary art scene – a status reflected by the success of his 2001 show with Mambo, a member of French artistic collective 9ème Concept, at Galerie Magda Danysz, Paris, and more recently at Manchester’s Urbis Museum.